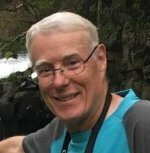 When I started out as a freelance travel writer, I thought my job would be to do the writing, and someone else would provide the travel photographs to go with my story. If you’re working with editors of glossy, high end, upscale magazines, like Travel & Leisure or National Geographic Travel, chances are they’ll commission professional photographers to take the shots. All you have to do is provide the copy. But these glossy magazines are rarely where you start your travel writing career. 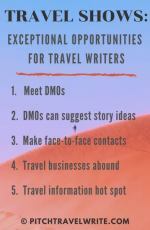 During your early years as a travel writer you’ll be writing for local or regional magazine. You might be writing for small niche magazines. And you’ll sell more stories by providing travel photographs to illustrate your article. 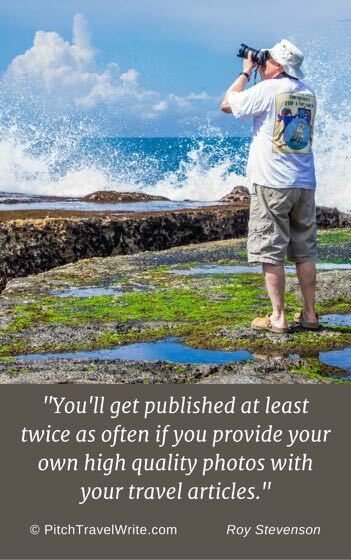 I estimate that you'll get published at least twice as often if you provide your own high quality photos with your travel articles. In my first year of writing, editors would sometimes ask if I had any travel photographs to accompany my story. If I was lucky and my wife had been along on the trip, I would have her gallery of photos to offer to the editor. After a couple of years freelancing, I would simply pitch the editor my travel story and automatically offer a gallery of photos. And that’s how I learned about the power of providing a gallery of high-resolution photographs to accompany my articles. Especially for travel articles, providing high quality photos is key. It turns out that editors love writers who can provide high quality images with their articles. Providing a photo gallery with your articles saves the editors time tracking down stock photos for the story. And, it probably also saves them money. Having your own travel photographs enhances your story because the travel photos that you (or your spouse) made will more closely relate to your words. They’re more relevant than some random stock photos taken by a stranger at a different point in time. As I gained more freelancing experience, I learned that some editors would only buy a story if photos accompany it. No photos, no sale. There are also certain genres I would not have been able to break into without providing my own photos. As an example, I write for a number of military vehicle and military history magazines. Without photos, I would not have been able to write for this genre. And I can tell you it’s a thrill to see my military travel stories published. 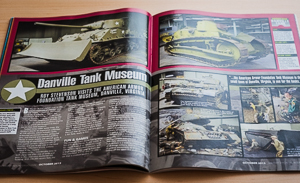 The magazine pages are packed with my travel photographs of military vehicles and artifacts. Be warned – sometimes you’ll spend more time taking photographs of the place than on interviews with museum curators or tour guides. In museums, especially, my photographs help me to write a more accurate and interesting story. Travel photographs will enhance your story if done well. To be publishable, they need to be in focus and well-composed. For print media, they also need to be high resolution. Cameras have come a long way in the past few years. 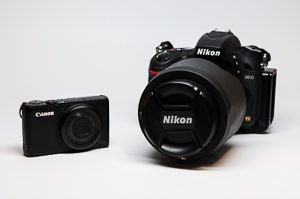 The majority of cameras out there will provide a high enough resolution image for print media. If you’re publishing your story online, this is less of an issue. I used a simple point-and-shoot camera the first four years of my travel writing career. This worked quite well and I was usually able to deliver a suitable number of images to accompany my articles. As a novice travel writer, I didn’t want to spend a bundle of money on an expensive camera that was bulky to carry and difficult to use, and I wanted to focus primarily on my writing. And when my wife was along on the trip, I relied mainly on her images to submit with my stories. But my wife doesn’t always travel with me, especially on trips that include track & field events, or anything military. So, the day came when I wanted to create higher quality photos of my own. That’s when I moved up to a DSLR. With only a little training on settings available on the camera, I was able to get some excellent action photos of distance runners at some track meets that came out so clearly they were worthy of publication. And the colors and clarity of my images improved thanks to newer technology and a better lens. I’m not a techie and I shoot on automatic or use one of the pre-programmed modes. But that works fine for me. Although I still can’t use the manual settings on the camera, my travel photographs are superb thanks to the number of megapixels and the high-quality lens. Cameras comes in all shapes and sizes. They can be as small as your smart phone or the size of a full format DSLR - and everything in between. I should start by telling you your camera phone is probably not going the take high enough quality photos for print magazines. I say “probably” because phone cameras have come a long way in the past couple of years. But I still don’t recommend relying on one if you’re pitching print. You might get away with it for online articles. Instead, I'd recommend some camera options. 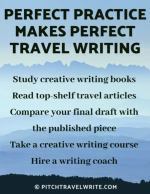 If you’re just getting started and unsure of whether travel writing is right for you, you can bring along a travel companion who already has a camera. As long as your companion is happy to do the photography, it’s one way to solve the problem. You’ll need to work together to get the right compositions and subjects. Otherwise, you're better off buying a camera and taking your own photos. The easiest type of camera is a point-and-shoot. They come is every price range and have a lot of capabilities. You can get a good one for less than $500 and a great one for considerably more. Canon PowerShot G9X (just under $400 on amazon.com). For outdoor adventurers the Olympus Stylus Tough TG-5 (waterproof and just under $400 on amazon.com). You can also opt for a higher end Sony Cybershot RX100V ($948 on amazon.com) or the Sony cybershot RX10IV ($1698 on amazon.com) with an amazing 24-600 lens. Later, if your travel writing takes off and you have an escalating demand for quality photos to accompany your articles, you can always upgrade to a mirrorless camera or DSLR when the time is right. Including the body and a moderately priced travel lens, mirrorless cameras will cost about $900 and upward. If you plan to do video as well with still photography, then the Panasonic Lumix G85 is a good choice ($598 on amazon.com). Along with the Panasonic Lumix 14-140mm f/3.5-5.6 zoom lens ($548 at amazon.com) it's great for travel. My wife has been using a Panasonic mirrorless camera and this lens for the past year for most of her travel photographs. It’s small and light – and she loves it for travel. Sony a7R II full-frame mirrorless camera ($2398 on amazon) and Sony FE 24-70mm F2.8 GM premium zoom lens ($2198 on amazon) or the less-expensive Sony Carl Zeiss Vario-Tessar T* E 16-70mm F4 ZA OSS compact zoom ($898 on amazon). This gives you a wide range of camera choices that are all good for travel, depending upon your budget and expertise with a camera. Every magazine has their own scheme about how they pay writers for their words. This also goes for travel photographs. Sometimes you’ll be paid directly for your photos. And if you do get paid, one thing is certain – there’s no consistency in the amount you’ll receive from one magazine to the next. Editors have paid me as little as $7.50 per photograph and as much as $375 for a photo, and everything in between. For some photo shoots I have been paid a set fee (for example $450) for providing a photo gallery. Sometimes the payment is indirect. Some magazine editors pay for articles “by the page” meaning that your photographs are included in your payment. Other editors pay for half page, quarter page, or full page photo spreads, and it depends upon how they use them. The bad news is, some editors don’t pay for your photos. But this isn’t necessarily bad news. In many instances, providing photographs is the deal clincher for the editor assigning the article. No photos – no article. Do You Want to Sell Your Travel Story? So the question becomes: how badly do you want to sell your travel story? Being able to provide a gallery of photos to accompany your article will result in getting published more often. I know it has garnered me dozens—perhaps hundreds—of published articles over the years. The way I figure it, I take photos everywhere I go anyway, just to jog my memory or use as background reference material when I’m writing my story. And if some of those photos are used to enhance my article – it’s a bonus. The only extra effort is to select a few and set them up on a photo gallery for the editor. I use Smugmug for my galleries and I love it. The Smugmug Power Plan costs $5.99 per month – less than the price of a couple lattes. With such inconsistency about whether or not you’ll be paid for photographs, how do you know what to expect? Simple. You can usually find out by reading the magazine’s “writer’s guidelines”, usually found on the magazine’s website. Once you read the guidelines, you can make an informed decision about whether or not you want to provide photos for your story. As a writer I always enjoy seeing my work in print – as I’m sure you do, too. And when my travel photographs are professionally laid out in the magazine illustrating my story, it’s a very satisfying feeling!